The Southern California Association of Governments is coordinating with Caltrans & Metro to conduct the I-105 Corridor Sustainability Study. The overall goals include improving mobility, accessability & equity, safety, sustainability and keeping systems in good repair. 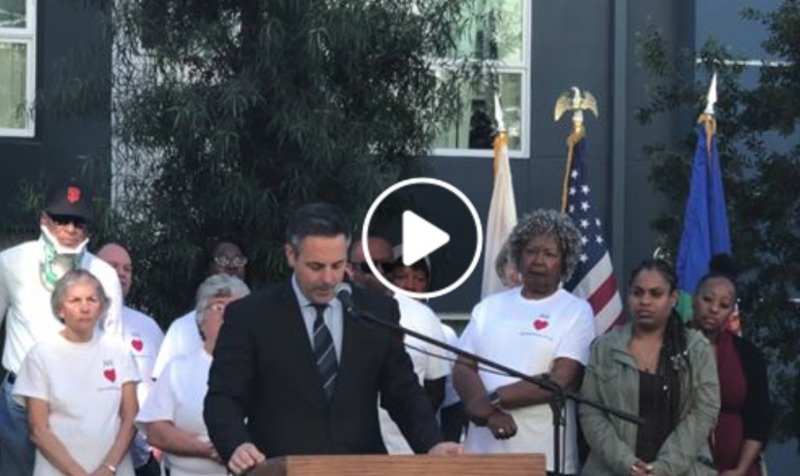 Harbor Gateway North Neighborhood Council (HGNNC) teamed with Councilmember Joe Buscaino (Dist. 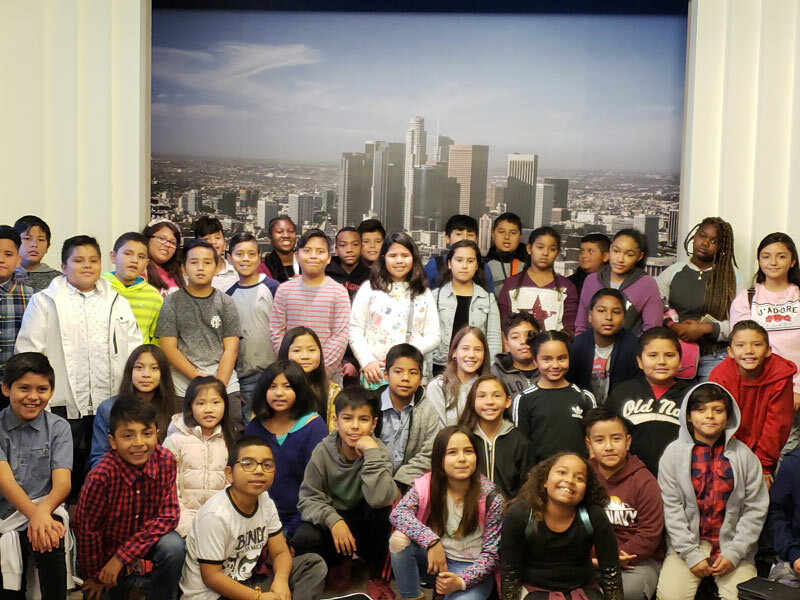 15) to sponsor 54 fifth grade students and two teachers from Gardena Elementary School for an educational site visit to City Hall on November 30, 2018. 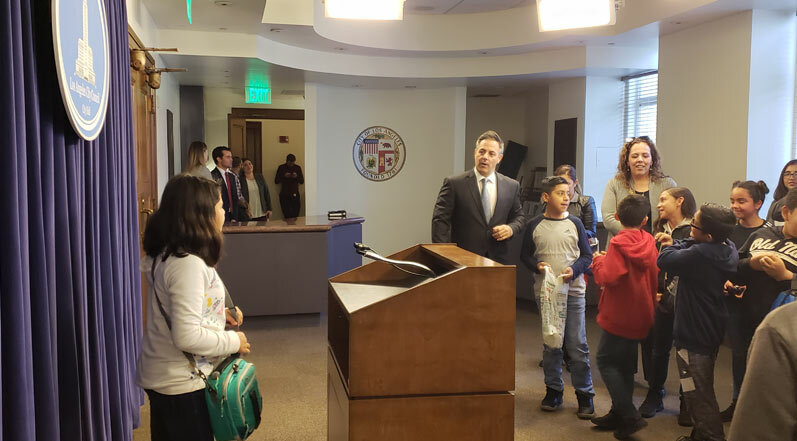 Students visited City Council Chambers, where the Councilman introduced them and took a group photo, then on to the Board of Public Works Hearing Room where they saw the Commissioners in action at their regular meeting. They got an introduction to how city government works and how they can help improve the quality of life in their neighborhood as good citizens. 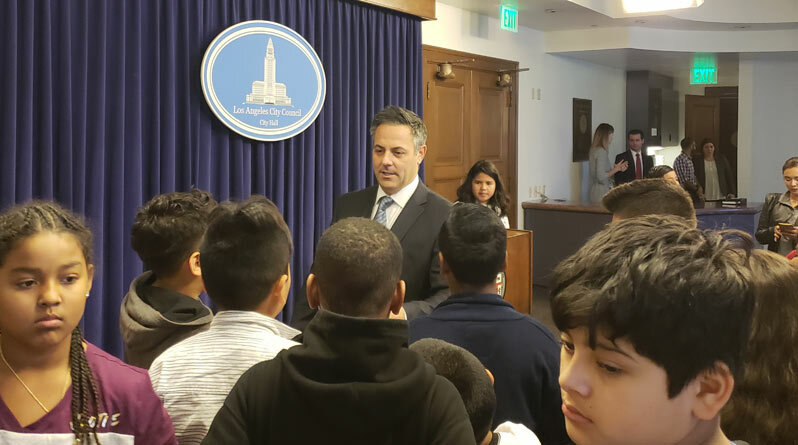 The visit included a tour of the Tom Bradley Room, where students learned about and saw photographs of every Mayor of the City of Los Angeles. Lunch and recreation at Grand Park near City Hall ended the visit. Students will submit reports on lessons learned to HGNNC before the holiday break. Many thanks for your support to Councilmember Buscaino’s staff and Aksel Palacios, Planning Deputy, Kevin James, Public Works Board President, Octaviano Rios, of EmpowerLA, Pamela Thornton, HGNNC President, Richard Lee, HGNNC Youth Advocate, Dr. (s) Blanca Cantu and Elda Pech, Gardena Elementary Principal and Assistant Principal, respectively, and 5th grade teachers Mrs. Valenzuela and Ms. Perez. Councilmember Buscaino reports that there are 32 homeless students at his daughter’s middle school in San Pedro. Student are asking for money or trying to sell products to earn money. There are over 15,000 homeless students across LAUSD. The conversation today about homelessness focuses on the most visible, those on the streets. Students are not as visible. Supply in housing at all income levels is the only solution that will work. His district is home to the largest public housing developments in the city. In Wilmington they recently opened 176 new units of low income housing. In Watts they are doubling the size of Jordan Downs from 700 to 1,400 units without displacing people. We need to build more housing, but it takes time. What do we do in the meantime? 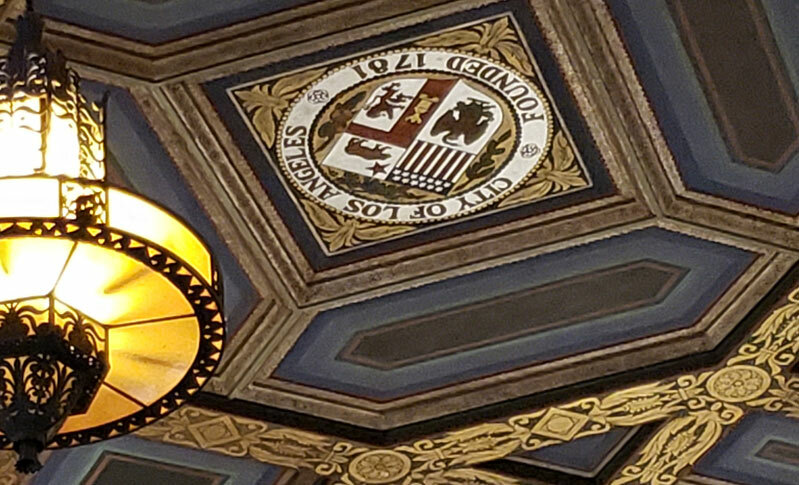 Our city’s answer is Mayor Eric Garcetti’s Bridge Home Housing. Buscaino has committed to building three bridge homes in Watts, San Pedro and Wilmington. Imagine having to sleep with your child in car. How safe would you feel and how well would you do at work and your child at school the next day? This is why Councilmember Buscaino supports safe parking programs, which include security guards, bathroom facilities and case workers. He is glad that LAUSD is looking at how to provide safe parking at every school with homeless students. Everyone is invited to volunteer at the Homeless Count on January 23 at 802 W. Gardena Blvd, Gardena. Sign Up Now.